InvestorCentric: Will Silver Prices Finally Break Out? Will Silver Prices Finally Break Out? Thinly traded as a precious metal, silver has long been subject to rapid ups and downs in the market place. Closer examination of silver historical trends have shown that its valuation has seen solid growth over the past decade but still remains "cheap". See the following post from Expected Returns. Precious metals investors have long been waiting for an upside breakout in silver. Given that investors have been put to sleep by the action in silver, it is not surprising that few not noticed that silver is approaching critical price levels. Silver is such a thinly traded market that moves to the upside tend to be explosive. Precious metals aficionados will recall the Hunt brothers' attempt to corner the silver market in the 1980's. Silver rose sharply to $50 before collapsing to $3. As I write this, silver is sitting at $19.60. So while silver has rallied considerably the past decade, on a historical basis, silver is still "cheap." Silver will be one of the prime beneficiaries in a currency crisis. I like to think of silver as the every day man's hedge against government fiscal mismanagement. This was no more evident than during the panic of 2008. As investors liquidated assets across the board, silver prices collapsed. However, premiums for physical silver shot up dramatically, which reflected supply constraints and healthy demand. So although silver is subject to short-term shenanigans, there is real demand underpinning this market. This is silver's third attempt in recent months to break out above $20. Given that silver has failed to take out $20 several times, a breakout move is going to be dramatic. Momentum buying should give the rally some serious legs. I can assure you that the rally in silver is flying under the radar. This make potential upside breakouts that much more exciting. 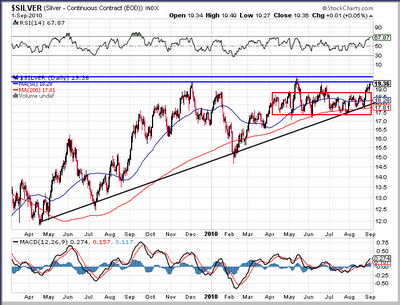 Silver has frustrated investors for quite some time with its failure to break out to new highs. But the long-term investor must deal with months, and sometimes years, of sideways action. I personally couldn't care less how long it takes for silver to explode since I have been accumulating shares on weakness. What I do know is that recognition in markets comes instantly. When the public recognizes the value embedded in silver, I want to be positioned in a big way.